It has got to be hard telling a story on stage, particularly in musical form, in the post-Hamilton era. Lin-Manuel Miranda’s groundbreaking work that blends history, hip-hop, fiction, great choreography, race-blind casting and traditional musical theater tropes is a near impossible example to live up to, let alone improve upon. I do not believe that the creators of Paradise Square, a new musical premiering in its latest form at Berkeley Rep, had Hamilton directly in mind as their show took shape (the first iteration called Hard Times, conceived and arranged by Black 47 frontman Larry Kirwan, premiered off-Broadway long before Hamilton, in 2012). Nor do they likely welcome the comparisons. 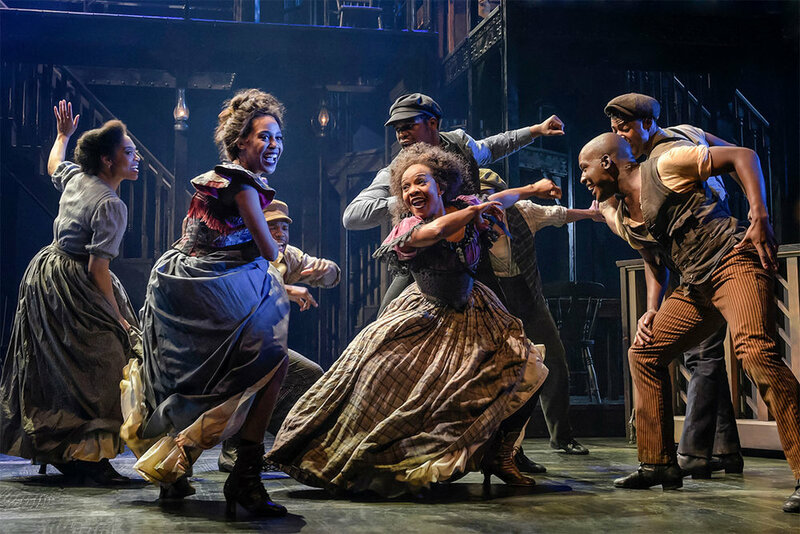 The comparisons, though, are inevitable when it’s a period show that is primarily about race and diversity in New York City, partly using contemporary musical idioms as well as great choreography. The set design, albeit a beautiful and dynamic one by Allen Moyer that evokes the stacked and rickety urban structures of 1863 Lower Manhattan, is also reminiscent of the similarly spare, multi-level wooden one designed for Hamilton by David Korins. This is not to say that Paradise Square does not stand on its own as a singular piece of theater with some inspired elements. So let me dispense with further comparisons and say that the work of Kirwan, in arranging and reimagining the music of American songbook master Stephen Foster in a new context, is terrific on its own. As is the brilliant direction of Moises Kaufman, and the truly inspired choreography by Bill T. Jones. Whether or not these three elements coalesce around the book (by Marcus Gardley, Craig Lucas and Larry Kirwan) into more than just an interesting collage about a little-known moment in history is up for debate. Firstly, the music: Kirwan took the work of Foster, some of it still very familiar to modern ears (“Oh! Susanna,” “Camptown Races,” “Jeanie With the Light Brown Hair”), some of it less so (“Angelina Baker,” “Nelly Was a Lady”) and gave it new context and some radically different arrangement, using the songs to tell the story of The Five Points neighborhood in New York. The Five Points is known to be the original melting pot of the larger melting pot of New York City, where the first wave of Irish immigration collided with free black people and other immigrants to inhabit the city’s first slum. Martin Scorsese’s Gangs of New York told the story of organized crime and violence in the Five Points, and Paradise Square focuses on the coming together of diverse people and perspectives to create music and dance. 1863, when the musical is set, was a time of great tumult both politically and culturally, and the backdrop of the Civil War and Lincoln’s first draft (The Enrollment Act of 1863) looms large. The play centers on a saloon in The Five Points inherited by a black woman named Nelly (Christina Sajous) after her Irish immigrant husband dies in the war. Annie O’Brien (the excellent Madeline Trumble), Nelly’s pistol-toting sister-in-law, is herself married to a black reverend (Daren A. Herbert), and helps look after the bar. Annie’s nephew Owen (A.J. Shively) arrives from Ireland seeking work, and ends up bunking with and befriending escaped slave William Henry Lane (Sidney Dupont), who shares his love of dance. Meanwhile, Nelly unknowingly hires Stephen Foster (Jacob Fishel), now a drunk who’s estranged from his wife and daughter, and living in the Five Points in the final years before his untimely death at the age of 37. The plot points are convenient to be sure — William Henry’s girlfriend, Angelina Baker (Gabrielle McClinton), for instance, inspires Foster to write the song of that name, and the real-life William Henry himself would go on to invent tap dancing, combining the Irish dance forms he found in the Five Points with African and slave dance. The movement work by Bill T. Jones — both with interstitial pieces that serve as interpretive backdrops to monologues and dialogue, and with more traditional solo and ensemble dance numbers in multiple styles — can not be over-praised. In fact, the choreography is so central to every major moment in the show that it feels like a dance piece with dialogue and song, rather than a musical with dancing. Jones tells a story of the latter days of slavery, of African dance entering the mainstream and co-mingling with Irish step-dancing, with evocative, wordless grace. What falls short in Paradise Square, ultimately, is the unifying plot and the sketches of characters, who all come off as two-dimensional. The central conflict and climax of the show is the Draft Riots of 1863 — a moment of terrific ugliness and unrest in New York City in which mobs of mostly Irish immigrants bludgeoned and killed African Americans and burned buildings to the ground in protest of the Civil War draft. Black people weren’t allowed to fight in the war, and newly arrived immigrants felt that this was not their war to fight, and took it out on poor blacks. The story elements that arise in between all feel generic and invented for the sake of a history lesson, with neither the specificity of fact nor the uniqueness of good fiction. The tales of ordinary people “race mixing” as it was called, and of Stephen Foster adopting a pseudonym in order to get a job in a black-owned saloon — where his songs about “darkies” like “My Old Kentucky Home” weren’t welcome — feel like fictional footnotes without much resonance. (It’s also fair to assume that the real Foster’s last year on earth, before dying under questionable though likely alcohol-related circumstances in 1864 at age 37, didn’t look nearly this pleasant.) And the final song given to Nelly, as she faces down an angry mob of rioters, would be a tour de force if it made any real sense in the story. I can see why so many talented people were drawn to this project, and I wish the sum of its parts equalled something greater than it does, if only for the sake of a historical moment and place that deserves attention. But as much as I want to see several of the dance numbers again and hear Kirwan’s marvelous arrangements once more, the play itself left me cold. ‘Paradise Square’ plays through February 24 at Berkeley Rep.